The children get all the use of the play facilities but when it comes to the party meal you take control. Playgroups, Mother and toddler Groups and Nurseries. Free tea/coffee for Group Leaders. From £19 per adult and child. Ideal for soldiers 6-8 years, wishing for a Battlezone Party. We offer a wide variety of parties from toddlers to adults, which are listed on this page. Once you have found the party you are looking for, you can then book the party online by clicking on the ‘book now’ button. You will then be able to check on the availability, on the day of your choice. Choose any of the party options you would like and how many children (or adults) are coming and pay the deposit, online in your own time. 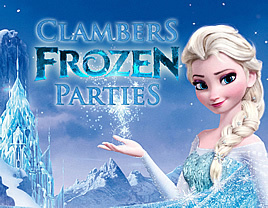 We are now offering Frozen Deluxe Parties. We have Elsa and Olaf costumes and themed tableware. Call 01424 423778 for your Little Princesses Party.